Fancy learning a new skill and enjoying a creative day with us? Here are new dates for courses and tours at The Stencil Library from now until early September 2018. Today, there are places on all of them but some classes and tours are limited to just four or six people. For full details please visit our website below you'll find dates and some information. Pre-booking and payment are required for all tours and classes. You can phone, email or reply to our social media pages. We can schedule private classes and tours too. Next week we are hosting: An evening tour of The Stencilled Home, a full-day class on creating Chinoiserie murals with stencils, a half-day class on stencilling fabrics and a new 'make & take' social event where we take a look around the house, eat cakes and then stencil a fabric project to take home. So, let me know soon if you want to book one of the imminent events! Prices and more details are on our website along with important info about the venue, where to stay and how to get here. **NEW** TOUR OF THE STENCILLED HOME WITH MAKE, BAKE AND TAKE! The new event is a variation on our usual 'Tour of the Stencilled Home'. You get the full guided house tour around The Stencilled Home, consume a little feast of a 'Northumbrian Afternoon Tea' and everyone gets to stencil a cushion cover like this one then takes it home with them. CHINESE FAKE-AWAY; We will give you an amazing set of stencils which are a starting point for creating your own stencilled mural decoration in the style of the 18th Chinese wallpapers. Then we will experiment with various ways of using those stencils. They include peonies, roses, birds and butterflies, all classic elements of the hand-painted Chinoiserie wallpapers. The class should give you the tools and the confidence to create your own decoration onto walls, fabrics, furniture.... or wallpaper. Together we will make a monochrome stencilled panel, everyone will work at their own pace. Don't worry if you work at a slower pace than others, the panel rolls up for easy transportation and can be finished at your leisure. You will learn to create a fabric effect background with glazes and I will demonstrate some simple gilding effects for you. DATES: Saturday 26th May 2018 or Saturday 8th September 2018. 9.15am to 5.30pm. BREAKING NEWS of ANOTHER NEW EVENT! I will be hosting a rehearsal class for our MOROCCAN STYLE FLOORCLOTH class at some point in August or September. Rehearsals classes have a discounted price and in return, you have to be nice if the timings and the project goes a little wonky. That's what rehearsals are for. This is the intended project. You will complete it during the class apart from the varnishing. You will take your floorcloth home along with the full set of stencils, along with the knowledge and confidence needed to create your next one. I will demonstrate the technique for the smaller panel, it is not intended that we stencil this one during the class unless we finish too early. Again, this is what rehearsals are for. Floorcloths are not that common in the UK. They are moppable, scrubbable and sit nicely on wooden or concrete floors. They were popular before linoleum was invented. In those days the floor cloths were oiled with linseed oil, now we use quick drying varnish. Decorative floor cloths can be stylish and useful. I have a couple of them that I drag to the lawn to lounge upon if I have guests and a sunny day. I have one in a bedroom too. Fancy it? Let me know if you are interested in and give a preferred month, August or September. I will see what month suits the majority. STENCIL TECHNIQUES; full day class with tour and lunch 9:45am - 5pm £80.00 Saturday, April 7th*, 2018. Sunday, May 20th, 2018. *The class on April 7th is followed by an optional 'Stencil Techniques for Furniture' day class on Sunday the 8th. This is to help people that are travelling a distance to attend 2 classes consecutively. There is a discount on the combined price if you attend both classes on this weekend. Details of the schedule and other important information are on our website. Students will experiment with a collection of corner, border, repeat and spot motif stencils to create panels, circlets and overall pattern. Special attention is given to corners, symmetry and contrast panels. Simple fantasy finishes will be demonstrated. Students will practice with paint and metal leaf. Many of the skills learned will apply to larger projects too. Participants should gain skills and confidence to customise pieces of furniture and other small-scale projects. Students take home more than £50.00 worth of stencils and completed samples of work. Lunch and refreshments are provided. The classes and tours take place in a private home, there are uneven floors and stairs. The house can be cold, even in summer, wear layers! These classes are limited to a maximum of 6 students. We can also host private classes or tours on other dates by request. If you have been meaning to take a tour of The Stencilled Home at Stocksfield Hall book it now! Here are the new dates for Spring and Summer 2018. This year we have added a new 'make, take and bake' tour of the house, ideal for a small group. Read on for dates and details. All of the rooms in Stocksfield Hall are decorated with stencils. It is the home of The Stencil Library partners. The house has been featured on television and in many books and magazines. The tour visits most of the rooms and the decoration of the different surfaces is explained and discussion is encouraged. After light refreshments, a demonstration of basic stencil techniques is given. Tours last about 2.5-3 hours. DATES: May 25 2018 7pm, June 24 2018 10am, June 27 2018 7pm, (July 7 2018 10am FULL), Sept 7 2018 7pm. PRICE £12 per person. DATES: May 23, 2018, 1pm. June 7, 2018, 1pm. July 8, 2018, 1pm. PRICE: £38 per person. The classes and tours take place in a private home, there are uneven floors and stairs. The house can be cold, even in summer… wear layers! Enchanted Belsay. An illuminating visit to Belsay Hall gardens on a winter night. Belsay Hall gardens were illuminated for nine evenings during December 2017, it was a new event called Enchanted Belsay. Here are a few of my snapshots and recollections from my visit. My first highlight was the projection of light and pattern onto the conifers that border one side of the croquet lawn. I settled onto a bench and watched them change from this to this, with a dozen colours and patterns in between. There was an effective illumination of trees, branches and twigs along the pathways. The lighting made it possible to view their form and texture in a fresh, abstract way. Some of the most dramatic views were above our heads. I thought the trees looked like coral. The light was timed to give moments of complete darkness which gave us time to appreciate the sparkling sky of a clear winter night. Another constellation was provided by a suspended mirror ball and was my favourite part of the event. Those that know me know how I like my mirror balls. I have them in my home and garden and if I could replicate the spectacle of Belsay's quarry garden resplendent with thousands of dancing shards of light spinning around its walls... I would. We approached the installation via a tall gateway cut through the rock. Once we were surrounded by the rock walls of the quarry there was nowhere for the reflections to escape to, so they spun along the ground, the cliff faces and the tops of the trees as the disco ball rotated high above us. I stopped taking video and photographs because I could not capture the fabulousness of it. I searched online for better images from other visitors but theirs did not do it justice either. You will just have to imagine a scene resembling a film clip from The Blue Planet featuring a million tiny, silvery fish travelling in glittering unison around a dark ocean, then translate the idea to a mosaic of mirror pieces throwing light around steep walls of craggy rock. My friend and I leant against those same rocks and let the lights swim over us. With reluctance, we left the quarry and followed the smell of fire and spices to the castle where there were food stalls and a small funfair. Marshmallows were being toasted, mulled wine consumed and selfies created. Tonight is the final night of Enchanted Belsay 2017. I believe it has sold out. I booked my ticket weeks ago and I am giving you advance information for next year, in case they host it again. The pathways are accessible by wheelchair and baby buggies. Well behaved dogs were welcomed and the event is family orientated. It was the third lighting event that I had enjoyed in just over a month. My conclusion was that Enchanted Belsay was it was a bit 'hit and miss' but the hits were so fabulous that and I would go again. Belsay is in Northumberland, the gardens are open in daylight all year round. They are part of English Heritage and are well worth a visit, take your walking boots. An exhibition of Scottish art including work by Michael Chippendale. Corrymella Scott has an art gallery in Corbridge, Northumberland. Between now and December 10th 2017 she is presenting an exhibition of Scottish Artists at The United Reform Church in Jesmond, Newcastle Upon Tyne. I was at the preview. Some of the artists come from Northumberland which is the border county between England and Scotland. My husband and Stencil Library partner Michael Chippendale was one of the Northumberland artists and three of his paintings were for sale at the exhibition. When I arrived one had already been sold, it was the tartan version of Kate of Many Colours. I am very fond of most of Chip's paintings and tartan Kate was a particular favourite but now she will be enjoyed by someone else. I have an Islamic tile version on my staircase. Corrymella's artists are represented on her website. However, if you are close enough to visit the exhibition the opening hours are Mon to Fri 10am-6pm. Sat 10-5. Sun 3rd Dec closed and Sunday 10th Dec 1pm-5pm. Here are some more of my snapshots from the exhibition: Portrait by Michael Chippendale, abstracts by Susi Bellamy. The artist Ruth Bond used a square of Harris Tweed as a starting point for her landscapes, there were a few 'red dots' beside her paintings. Chips and I standing near another of his portraits. Isle of Harris Gin provided refreshment. I did not get to sample it because I was driving but I heard good things....and there is a small chance that I might win the prize draw. A Christmas event at The Stencil Library. Our annual Christmas themed tour of The Stencilled Home is almost fully booked but if there is enough demand we will host another later on the same day. The tour and demonstration will start at 10.am on the 9th of December 2017. We will take a look at the stencilled decoration in twelve of the rooms at Stocksfield Hall; many will be adorned for the festive season. The demonstrations of techniques for stencilling will have a Christmas holiday theme and so will the refreshments. The event takes around two to two and a half hours which will give you time to explore other areas and events near to us. There are many wonderful restaurants and speciality shops within 5 miles of The Stencil Library and we would be happy to make recommendations to make your visit even more interesting. The Stencilled Home is less than 10 minutes walk from bus and rail and there is plenty of parking for cars. Our Christmas tours have been described as a 'visual feast!' and a 'Christmas tradition'. Stocksfield Hall is an old house, it has stairs and some of the floors uneven. Please bear this in mind when booking. Tickets are £10.00 and must be booked in advance. If the 10.am tour becomes full we will consider hosting another at 2 pm. Please contact us for information, there is contact information on the top photograph or click ABOUT on the top right-hand side of this page. You can always leave a private comment for us on this blog. What is the best and worst thing about loaning your home for a photo shoot? What is the best thing about having RE, the hugely stylish homeware company use your home for a photo-shoot? Well, apart from the RE team being the most delightful people to have around everything they placed on my furniture, walls, floors and bathtub looked perfect in their new surroundings. and African print cushions snuggled up on my sofa. A jungle sprouted in the main bathroom and another grew in our drawing room. A resin menagerie of money boxes populated every surface they could lay their paws and bottoms on. Budgies, crows and fake feathered birds for every nook and cranny? I think so. Did it look weird? No, it looked normal...for us. My home looked for all the world as if it was their home too and that was also the worst thing about having RE use your home for a photo shoot, everything was a perfect fit....so, after the shoot, I had to go shopping. My previously quirky, colourful home looked a little bereft of both quirk and colour once the flamingos, monkeys, budgies and crows flitted back to their packing boxes. Immediately, I ordered a red flamingo of my own and a tall black candlestick. I am still pondering on the resin monkeys because I am creating singerie stencils at the moment, therefore, a monkey or two is relevant…maybe essential. I have a gift voucher and RE is hosting an event for local people this evening...can't wait, we'll have a ball!! Ushaw, the North East's newest heritage site has gorgeous stencil work! I visited it with a friend and fellow decorative painter. We had gone to see the exhibition of large and life-like tapestries by Chuck Close. I am always impressed by his work. This one is a self-portrait. The exhibition has been extended until the end of October and is well worth seeing. The tapestries are impressive and I want to return and take another look because I got distracted...hugely, by the room in which they were displayed. I could go on and on so I will show you a few snaps from my brief time there and link you to their site so that you can plan your visit, there is a book called Treasures of Ushaw Whilst there, I witnessed people tucking into an 'afternoon tea' in the refectory, my friend and I were too late to do the same but that is another reason to return, along with a walk around their gardens. The refectory has many portraits, windows and stencilled banners. Sometimes I toy with the idea of hosting a week of stencilling and decorative painting classes interspersed with excursions to beautiful places in Northumberland and Durham...this one would be definitely on the list. The Stencil Library sells many stencils similar to the ones at Ushaw, mostly in their Gothic range but there are some in Arts & Crafts too. I hope you enjoy seeing a little more of it. and some that were stunning because of the structure. I felt that I was in a Vermeer painting whilst walking these corridors. There are many corridors, all of them different. I saw a vivid green and blue feathered hat on a vintage trading site. I bought it to compliment a long skirt that I stencilled a few years ago. If the style didn't suit me I would display it in my dressing room instead of wearing it. When the parcel arrived the hat was a perfect fit, however, the packaging in which it was delivered was almost as thrilling as the contents. The original box had been sent by post from the millinery department of Bobby's of Bournemouth to a Miss Doughty on the 30th of April 1963. I learned that Bobby's existed from 1915 until 1972 when it was rebranded as a Debenhams store. Just twenty years before Miss Doughty purchased her hat Bobby's took a direct hit from a German bombing raid that devastated the town of Bournemouth. The history of Bobby's was fascinating and could have spent more time reading it. I then turned my attention to Miss Doughty and her address, Bowlish House, Shepton Mallet, Somerset. I don't know whether Bowlish House was Miss Doughty's home or whether she was working there or just visiting, what I do know is that Bowlish House is gorgeously, gloriously Georgian and is now an hotel. I had mistakenly thought that Bowlish House was open for tours this Wednesday and asked the current hotel owners about booking tickets it but the tours are at 'Old' Bowlish House which is a private home and one can book tickets through Invitation to View. Goodness, if the new Bowlish House stems from the 1730's how old must Old Bowlish House be?? Anyway, this new information took me off on a tangent looking at lots of wonderful homes that host the occasional tour via the 'Invitation To View' website. Recently, I was visiting an imaginatively decorated home at Holland Park Avenue as part of the OpenHouseLondon weekend. They recommended another in Great Dunmow called Talliston and I saw that you could book tours of it through Invitation to View. My home is highly decorative too and is open for tours on Wednesday, Nov 15th and Saturday, Dec 9th this year. It is not part of the offering from Invitation To View. Pre-booking is needed and there is more information on our site. Contact us for tickets. A giddy hour later I realised that I had to get my work finished and dinner made. I told my husband about Miss Doughty's hat and the Georgian house in Shepton Mallet, he looked at the photo of Bowlish House on my screen and said: "I think we stayed there in 1982, we were on our way to Glastonbury". I felt even closer to Miss Doughty and her delicious hat. Would you like to learn how to stencil fabrics for furnishing and fashion successfully? Then read on. …in between, there have been many projects involving stencils and fabrics. This autumn I will be teaching a new half day class called ‘How to stencil fabric’ I will teach it for IDAL, the Decorative Artisans League at their convention at Greensboro, North Carolina on October if you sign up before Sept they offer a discount. My other class is in the UK, it will be a rehearsal class hosted at The Stencil Library; See details at the end of this post. Add a new dimension to your decorative skills with stencilled fabric. No ladders or scaffold involved! Stunning results can be achieved on curtains, soft furnishings and clothing. Color matches for interiors can be achieved with ease allowing another dimension to your decorative work. The set of stencils provided to students will be suitable for many projects not just for fabric. The mechanics of the project apply to wall, furniture and floor finishes too. difficult materials to decorate; one will be a ready made cushion cover. By the end of the class, students will have learned and practised my techniques for stencilling cloth. They should understand which media, colours and method work well for different fabric. Rehearsal classes at The Stencil Library are limited to five students only and must be booked in advance. Cheeseburn Sculpture Garden near Stamfordham, Northumberland is not open every weekend but it is open tomorrow and Sunday..that is the 3rd and 4th of September. I visited it last Sunday, admission was free of charge, a donation is suggested and appreciated and there is a tea room that offers fab cakes. There are nine acres of garden to wander around and enjoy. To find out more visit their web site. Here are a few of my photographs from last Sunday, between the rain showers. I do like a good door in a garden wall and a shiny wooden looking ball balanced on a tree branch. There were all sorts of spectacular ornamentation in the trees and the trees themselves were sculptural. I really wanted to curl up in the arm of this one. I spent a long time contemplating this shiny glass looking shape, it changes colour according to your angle of view and almost disappears when photographed. The garden plants were another highlight for me and I'll be sourcing a thalictrum like this one for my own plot. Danielle Clayton is helping me to tame and revive the flower borders at my house and she tends the garden at Cheeseburn....which is considerably bigger than mine! So, if you like to buy art, look at art or just wander around a lovely garden and treat yourself to cake Cheeseburn Sculpture Gardens may be just the place to visit this weekend. There are many decorative buildings that I would like to see, one of them is Drottningholm Palace in Sweden. I should be in Stockholm next month and am rather excited that there just may be a chance to visit the palace. When I moved to my present home in the mid 1990 I knew that I wanted a room based on 18th cenury Swedish Interiors...I got two. The kitchen features our FS4 Tree of Life stencil on the walls. The design is based on Chinoiserie style walls in a dressing room at the Drottningholm Palace Theatre. The colours were earthy which is in keeping with the original; however Chinoiserie painted walls were often brightly coloured as this version of the same stencil design shows. The other room in our home that was inspired by the Gustavian era was a bedroom and I used floral stencils from our range called Garden Room Stencils. I painted it in 1997. This room still exists at the moment and can be seen on our tours of Stocksfield Hall and on our stencil day class. The repeating stencil pattern on the floor and the fireplace is BW25. The flowers are from The Garden Room collection and the border stencil that frames them is ER16 a Laurel Border. The first picture in this post is a collage that I made from images of the walls in a dressing room at Drottningholm Palace Theatre I found the pictures on Pinterest but I think a couple of them originated in World Of Interiors magazine. We are now taking bookings for classes and tours at our HQ in Stocksfield during Spring/Summer 2016. Until the dates are live on our site places can be secured by email or phone. Many students and visitors have asked for a class on our gilded glass techniques so I am pleased to have reinstated that class for just one date in June. This class gives a good base to develop stencilling skills along with plenty of inspiration for using them. The day involves plenty of hands on practical work, demonstrations and a visit to stencilled rooms at Stocksfield Hall. Students will learn to cut a stencil and experiment with different media and surfaces including fabric. Participants should gain confidence and skills to tackle larger scale projects such as walls, floors and soft furnishings. Students keep their completed samples and a starter kit worth around £30.00 which includes brushes and stencils. Students will experiment with a collection of corner, border, repeat and spot motif stencils to create panels, circlets and overall pattern. Special attention is given to corners, symmetry and contrast panels. Simple fantasy finishes will be demonstrated. Students will practice with paint and metal leaf. Many of the skills learned will apply to larger projects too. Participants should gain skills and confidence to customise pieces of furniture and other small scale projects. Students take home more than £50.00 worth of stencils and completed samples of work along with notes to accompany the class. MIRROR IMAGE day class. Sunday 12th June. Create a decorative mirror finish on a framed acrylic panel (size approx 30x40cms). Students will explore stencilling reverse colour onto a transparent surface before gilding it. A unique water gilding process and metal leaf will be employed. This technique can transform flat glass or acrylic into a decorative mirror effect suitable for wall panels, splash-backs and furniture. The mirror frame will be decorated using another gilding process. Students keep framed panel, stencil and notes. Total beginners and those with previous stencilling experience should benefit from all classes. Also, the tuition may be useful for those that are already teaching paint related workshops and want to add some extra skills to their repertoire. We will start with the basic stencil skills then build. Once the techniques have been demonstrated the students will work and experiment to their own level. Bring a note book, tape measure and an overall/apron. The cost of the Stencil Techniques for Furniture and the Mirror Image day class are £95.00 each and the Stencil Techniques with Tour is £75.00. Refreshments, lunch and materials are provided. We offer a price reduction of £5.00 per class when both classes are attended on the same weekend. Stencil days are hosted on Saturdays and furniture classes on Sundays (except Sun June 12th) this is to provide better value for those that have to travel far. A student does not need to have completed our Stencil Techniques Day class before booking the Furniture or Mirror class but if an entire weekend can be spared it is well worth doing both together. Stencil brushes are provided for students attending Stencil Techniques with Tour, brushes can be bought on site for the other classes or bring your own. Refreshments are served at 09.45, classes start at 10.00 and finish at 17.00 approximately. TOURS OF THE STENCILLED HOME Tours are on Wednesday evenings: 6th April, 4th May, 8th June, 13th July. Start 19.00 finish around 21.30pm - Cost £10.00 per person. Stocksfield Hall is the home of the Stencil Library partners and has been featured on television, books and magazines worldwide. The tour visits most of the stencilled rooms, the decoration of the different surfaces are explained and discussion is encouraged. After light refreshments a demonstration of various stencil techniques is given. Stocksfield is situated in The Tyne Valley; a short train ride or a longer bus ride from the city of Newcastle Upon Tyne and from the historic market towns of Hexham and Corbridge. There is accommodation to suit various budgets within these locations and public transport between them and Stocksfield. There is B&B accommodation in Stocksfield Village but you will need to walk or drive from them to us. We have a car park for visitors to the Stencil Library. Newcastle upon Tyne, is 17 miles away and has an airport, train, bus and coach station. The Stencil Library, Stocksfield Hall, Stocksfield, Northumberland, NE43 7TN. Tel 01661 844844. info@stencil-library.com. Classes are limited to a maximum of 6 students and Tours to a maximum of 15 persons. All classes and tours must be booked in advance; full payment is required with your booking and confirmation will be sent upon receipt. The annual festive tour of our stencilled home will be next Saturday, the 12th of December. To book tickets please contact me. The festive event differs from our usual tours ...expect baubles, snowflakes, greenery, goldery, Christmassy themed stencil demos and festive refreshment. As usual we will visit the stencilled rooms at Stocksfield Hall, questions are welcomed and you can bring your note book and camera. The stencil demonstrations will concentrate on seasonal projects however the technique that is used for cards, wrap and napkins is similar to the one for walls,furniture or fabrics on a larger scale. So if you are wanting decorative inspiration for the new year you should still be informed and inspired by your visit. Tickets are £10.00 each booked in advance. The doors are open at 10.15 and we start our tour at 10.30; the event lasts 2 to 2 and a half hours...just in time for lunch. There are several eateries within a few minutes drive. Contact details are here or contact us on through this blog,our Facebook page or Twitter. Maps will be provided with tickets. We are on the River Tyne at Stocksfield in the Tyne Valley of Northumberland. Postcode NE43 7TN. We are half an hour from Newcastle by train or car, 40 minutes from Carlisle and a few minutes drive or train from the delightful village of Corbridge. There are a lot of picturesque things to see and do in the vicinity of The Stencil Library. I hope to hear from you, the tickets have only just gone on sale but we can not fit too many people in! As an IKEA Family Card holder I received an invitation to 'A taste of Sweden' at their Gateshead store. The event was part of the annual Ideas Festival held in IKEA branches throughout the UK and possibly the world. Our group learned a little about the history of Swedish decorative style and fare then the chef prepared food and offered samples for us to taste. Did you know Gravadlax means salmon from the grave and refers to the days when the fish was stored deep in the sand...or that Scottish architect and designer Charles Rennie Mackintosh was a large influence on Swedish interiors? I did not. Mocktails were mixed for us, I intend to recreate the 'Cosmo' with fresh orange juice, a dash of lignonberry syrup and half a lemon squeezed into each glass full. Each participant took home a gift bag of 'things for the table' and the workshops were free of charge for IKEA's family card members. Later this week they will host their Crayfish Festival in many UK branches... another good and tasty reason to join their loyalty scheme. I was surprised to learn that there were still tickets available for my local store at Gateshead. They can be bought from the restaurant and Swedish food shop within IKEA. Later I trawled the sales floor and saw a beetle cushion to accompany our SIB22-M beetle stencil. If I wanted to wander around clutching a cushion it may have complemented a skirt that my friend Betty made for me with fabric that we bought from IKEA last year. There was a children' workshop to encourage young gardeners to grow food and another one to introduce them to cooking. I think IKEA might approve of my mother's planter of ornamental and edible plants that I visited on my way home..
IKEA had given Family Card members a £10 voucher to spend at the Ideas Festival; mine helped towards the cost of buying both real and fake plants for my window and some power tools. We have a tour around our stencilled house next month so I must repair things! I was just about to leave IKEA after having spent an entertaining, informative and tasty morning when I checked my receipt. 'Scan me' it read; so I took it to the Family Card scanner and found that I had won a table lamp...which I shall collect when I go to the Crayfish Festival. Thank you IKEA. I enjoyed being part of the family. Come with me to the annual Bywell Arts Festival, it is a very short walk from The Stencil Library. We'll walk down our drive and over Bywell Bridge, the light is rubbish for enhancing the view from either side of the bridge this morning but it will give you an idea of where this place is. and we are almost there. The cakes are being unwrapped, early birds are buying plants, I bought several but more were arriving. There is a good mixture of professional and amateur painters, some only show at Bywell and some create work especially for the weekend. Most are from the surrounding area. I am not showing this year but my husband is. Bywell is tiny, there are two churches, St Peter's and St Andrew's, a handful of beautiful old stone houses and a castle. The Arts Festival weekend is a rare chance to see both of churches open. There is free entry and plenty of parking. #BywellArtsFest is open today until 4.30 and tomorrow from 11. Tonight there is a concert by Prudhoe Communty Choir and there are tickets from the central store in nearby Stocksfield. Bywell on Tyne, Stocksfield, NE43, Northumberland. My Arts and Crafts style stencilled dining room. Soon I will be redecorating the arts and crafts style dining room at Stocksfield Hall. At the moment I use the room as a venue for stencil classes and as a painting studio more than I do for hosting dinner parties but I will re-decorate and re-stencil with entertaining in mind a rather than creating a purely functional space. Three of the walls carry the stencil design DE76 it is a repeating pattern of birds and bamboo, we used a combination of household paint and copper leaf to colour the stencil. Panels of copper transfer leaf were stencilled onto the lower half of the room and I stencilled DE155 a lily flower onto it. If the paint does not adhere properly it may be that oil from your skin is present on the metal leaf. Simply add a tiny bit of soap or dish detergent to the paint and try again. The pattern on the fireplace wall is DE83 and I stencilled the same pattern onto the velvet of the table runner. I used a handful of colours on the wall and blended them in a fairly haphazard way for a soft and informal look. A post published on DesignInspiration in 2007 showed and described how to stencil the walls, floors and fabrics to create an Arts & Crafts look similar to the one at Stocksfield. Inspiration for our stencilled room included The Morris Room at the V&A Museum cafe. I have bought furniture from the local charity shop to house the stencil supplies for our classes as well as dinner plates and glasses. I will be sad to paint over the decoration in the dining room but excited to create a new interior. The floors were affected by a flood six years ago and that is the main reason for the re-do because the paint is chipping away in areas. The main thoroughfare through the room is traversed many times because it is the route from the kitchen to our office. Originally more layers of varnish were applied to that area of floor and as a result it has held up better than the less trodden places. Chips and I are discussing plans for the new decoration, nothing is formalised yet but I think that I'll make stencilled mirror to set into the window surrounds which should boost the light from both sun and candles. I have employed this stencil and gilding technique in other rooms. I would like another richly patterned, stencilled floor or an ornate, painted ceiling....maybe both! Are you a fan of feathers? You have until April 19th 2015 to see 'Birds of Paradise: Plumes & Feathers in Fashion' at The Bowes Museum, Barnard Castle, Co Durham. The show is presented by MoMu Fashion Museum Antwerp and The Bowes is the only UK venue to be showing the fashion exhibition...so that is quite a feather in their cap! I visited..it was gorgeous. Unfortunately many of my pictures were shaky due to a combination of low light and high caffeine. If you can not get to Barnard Castle you will find photos and information on The Bowe's site and blogger Pink Bow attended the exhibition and she always has good pictures. One of the very helpful assistants showed me that the feathers in this dress are all inserted from the inside out for maximum fluffiness. One of the last Parisian design houses to practise “plumassier” - the traditional way of using plumes in haute couture has made samples especially for the exhibition. The colours and textures are exquisite. Chicken on a sleeve anyone? The dress beside the rooster coat is embroidered with feathers. It is a gorgeous drive over the hills from my home in Stocksfield to The Bowes Museum but is a little too far to make frequent visits. However, I bought an annual membership so will make an extra effort. There are some wonderful exhibitions throughout the year. Go to The Bowes website to learn more about this collection and other highlights for this year. PS. We have some fabulous, feather stencils to order from our site at The Stencil Library, put feather into the search to find them. The fan dancer stencil and the vintage feathers are particularly lovely. New page, new dates, new stencil classes. 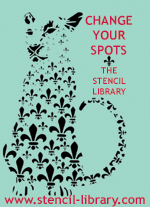 The new dates for our stencil classes are now on The Stencil Library website. We start with the 7th and 8th of March. The subject on Saturday is stencilling techniques for various surfaces including fabric and the Sunday class concerns itself with stencil techniques for decorating furniture and smaller scale projects. Both days are suitable for beginners and those that have experience. To book places phone or email us. Recently I taught a new class covering stencil techniques for decorating furniture and small scale projects. I demonstrated finishes that resembled Lapis Lazuli and Malachite along with decoupage techniques. The students learned how to fit corner pieces, coach lines, borders and repeat pattern together. Handy tips for measuring surfaces and placing motifs were explained and undertaken. We completed two painted sample boards using all the knowledge that we had accrued. Although we all enjoyed the classes it was a lot to achieve in four hours so I have adapted the class to be a full day with lunch. I am very excited to offer the longer class as it will offer the opportunity to extend the techniques and complete another sample board. The new Stencil Techniques for Furniture workshops will take place on Sundays to follow our Stencil Day; This offers better value for those that have to travel far. A student does not need to have completed our Stencil Day class before booking the furniture class but if an entire weekend can be spared it is well worth doing both together. What can we expect from the STENCIL TECHNIQUES FOR FURNITURE day? To gain the skills and confidence to allow you to customise pieces or furniture and other small scale projects. Using paint, metal leaf and acrylic glaze students will experiment with a collection of corner, border, repeat and spot motif stencils to create panels, circlets and overall pattern. Special attention is given to corners, symmetry and contrast panels. Simple fantasy finishes and decoupage will be demonstrated. Most of the skills learned will apply to larger projects too. Three samples will be created after experimentation on paper. Do we get anything to take home? Yes, you will take home more than £50.00 worth of stencils and completed samples of your work along with knowledge, confidence and notes to accompany the class. What can we expect on the STENCIL DAY? Students will experiment with different techniques, media and surfaces.The stencil day covers techniques for larger scale projects such as walls, floors and fabrics. Students will learn how to cut a stencil. Paints for walls and fabrics will be employed along with oil sticks, metal foils and powders. A tour of stencilled rooms at Stocksfield Hall forms part of our day, the class aims to be busy, fun and give a good foundation for building stencil skills. Is there accomodation nearby? Yes, We are a short train ride or a longer bus ride from the City of Newcastle Upon Tyne and the historic market towns of Hexham and Corbridge. You will find accommodation to suit various budgets and public transport in those places. There is B&B accommodation in Stocksfield village too, but you will need to walk or drive from them. The Stencil Library has a car park. Newcastle upon Tyne, is 17 miles away and has an airport, train, bus and coach station. What do we need to bring to class? Bring a note book, tape measure and an overall/apron. Note The workshops take place in my home, there are uneven floors and stairs. The house can be cold, even in summer...wear layers! Both classes are limited to a maximum of six students. How do I book? Phone, postal and email details for The Stencil Library can be found here Alternatively, contact our Twitter or Facebook page or leave a comment on this blog and we will contact you. The cost of the Stencil Techniques for Furniture day is £95.00 and the Stencil Day class is £75.00 Refreshments, lunch and materials are provided. We offer a price reduction of £5.00 per class when both classes are attended on the same weekend. See, there is such a thing as a free lunch! Students may take advantage of a 10% discount when ordering stencils and equipment on the day. I am happy to run private classes for small groups on other dates. Refreshments are served at 09.45 we start stencilling at 10.00 and finish at 17.00 Fancy it? Contact us. Two of my favourite UK shops are now within 20 feet of each other. The fabulous gift and book shop at The Baltic Centre for Contemporary Art has a new neighbour accross the foyer. The Northumbrian homewares designer and retailer RE has joined them until Christmas. The REH@B store is a pop up offspring of The famouse RE store in Corbridge, Northmberland. RE's previous pop up was in Liberty of London, this one is a lot closer to home.....both theirs and mine. Last weekend I popped to the pop up to share a glass of bubbly with owners Simon and Jenny and to buy a couple of things for my pantry which is due for a RE-do.Those French string bag have a multitude of uses and I could not resisit a polka dot pooch. I made the observation that Rachel and I have mentioned RE so much REcently that DesignInspiration looks like it could be their blog rather than ours. However, they do such interesting things that we feel duty bound to report them. REh@B brings the REally unusual, the REcycled, the REmarkable the REscued and the REstored – found objects from around the world to Newcastle and Gateshead shoppers. Can't get to Corbridge or The Baltic Centre? Visit RE-Found Objects. and let them come to you. Hands up who wants to go to Re-H@B? I am thrilled that I have have been invited to teach two workshop classes to members of IDAL at their Convention in Fort Worth, Texas this year. I will tell more about IDAL later but here is a link to their web site. These classes are totally new so I will be running two rehearsal classes in the UK before I leave in September. One class concerns stencilling furniture and small scale projects and the other teaches various techniques which will combine to create an artwork inspired by Japan. The stencils for each class are supplied and are yours to keep. Refreshments and a light lunch will be provided. Both rehearsal classes are hosted at my home at The Stencil Library, Stocksfield, Northumberland. In this post I will tell you about the first of the classes then publish the second subject later this week. So, the first event is Stencilling Fabulous Finishes for Furniture. Sunday August 31st 2014. 11am-4pm. This is a useful class whether you paint furniture for fun, profit or host workshops on the subject. What is a rehearsal class? Well, they are the debut class of any new subject that we introduce; Because they are untested timings and results may go askew. Therefore a rehearsal class is offered at a lower than usual price. What can we expect from the class? To gain the skills and confidence to allow you to customise pieces or furniture and other small scale projects. You can expect a small group; a maximum of six students. What will we do at the class? Using paint, metal leaf and acrylic glaze we will experiment with a collection of corner, border, repeat and spot motif stencils to create panels, circlets and overall pattern. Special attention is given to corners, symmetry and contrast panels. Simple fantasy finishes and decoupage will be demonstrated. The skills learned will apply to larger projects too. A minimum of two samples will be created after experimentation on paper. Do we get anything to take home? Yes, you will take home more than £50.00 worth of stencils; two, possibly three completed samples of your work along with knowledge, confidence and notes to accompany the class. Is there accomodation nearby? Yes, We are a short train ride from the City of Newcastle Upon Tyne and the historic market towns of Hexham and Corbridge. You will find accomodation to suit various budgets and public transport. There is B&B accomodation in Stocksfield village too, but you will need to walk or drive from them. Do we need to bring supplies to class? Bring a note book, tape measure and an overall/apron. The class is held in my home, there are uneven floors and stairs. Lunch and refreshments are served during the day. The house can be cold, even in summer...wear layers. C'mon it could be fun...Helen. Spending fifteen minutes basking in the light from Daniel Buren's installation at the Baltic Mill is as good as an hour in a spa. No, really, trust me. It gives a hit of happiness. Try to pick a sun-shiney day because the intensity of colours changes with light and weather. I arrived at 2pm there were a few fluffy clouds above the glass roof which gave variety between muted and concentrated reflection. From this..
Where is the Baltic Mill? It sits at the edge of the River Tyne in Gateshead just a short stroll across the Millenium Bridge from the English city of Newcastle upon Tyne. One floor is full of sculptures that use colour and light for impact and the other is the giant stained glass. There is a viewing platform above reflection, when you have enjoyed being in the artwork you can watch others do the same. Children were dancing in the colours and trying to catch them. There was a genuine shared enjoyment of the experience. My mum and I were having a brilliant time. One can ride in the glass lift between the floors but we chose the stairs, with mirrors on floor and ceiling the stairwell became another artwork. Daniel Buren is at level 3 and 4 of The Baltic until October 12th. Entrance is free but donations are most welcome. I'll be back. The Decorating Team visit Northumberland. This week found Sabina, Emma and I decorating a fifteenth century home in rural Northumberland. Sabina's speciality is trompe l'oeil and paint effects. On this occasion Sabina woodgrained the doors along the hallways, Emma stencilled the bathroom doors and I did the walls and bath tub. Sabina and Emma model the 'door decorator up do' hair style. Emma is now in her fourth month with us. Although she has created and completed many projects at The Stencil Library this was the first time that she had joined us for a commissioned project. Emma described the experience as 'comfortable' it was well within her level of stencilling skill. Our clients chose the colours and the basic design for the stencil work and from their instruction we made a bespoke versions of CE41 and CE42 from our range of Celtic Stencils. They even made a rough sketch of where they would like the decoration to be. This is quite rare as most customers leave it all to us. We have worked with these homeowners on other projects in the past decade, their home has historical significance and is a local landmark, the owners have succesfully modernised the building whilst keeping the bones and spirit of the place. Paint thoughout the room was from Farrow & Ball and the stencil work took less than a tester pot of each of Blue Green and Oval Room Blue in matt emulsion. A Raw Sienna colour from Liquitex Paint was selected to unify the grapes on the stencil with the wooden mirror frame and cabinets. I used F&B Estate Eggshell paint to stencil the bath because that was what it had been undercoated with and emulsion paint seldom covers well on a semi sheen surface. Curved surfaces such as a bath tub are a little tricky but if you stencil them a section at a time good results are achievable. It was a lovely, creative couple of days made better by sunshine, teamwork and excellent coffee. Refreshments are served at 9.45 we start stencilling at 10. Students will experiment with different techniques, media and surfaces. By 5 ish the students should leave with skill, experience, confidence and a starter kit worth approx £30.00 All materials will be provided, so will refreshments and a cooked lunch. A tour of the stencilled rooms at Stocksfield Hall forms part of our day, the class aims to be busy, fun and give a good foundations for building stencil skills. Places are limited to six students and costs £75.00 each. Fancy it? Our contact details are on The Stencil Library website. Stocksfield can be reached by train, bus or car. Parking is plentiful. Newcastle upon Tyne, is 17 miles away and has an airport, train and coach station. Our June 15th stencil class is full. We will start a waiting list and should anyone cancel we can contact those on our list. A couple of weeks ago a friend told me that he enjoyed taking his grandchildren to the sea front at Blyth in Northumberland. He said "They have fabulous beach huts, a great playpark and an ice cream parlour". Well the play park was of no interest to me although I was impressed when I did see it...but beach huts and ice cream parlour are five words that will get me into the car and heading for the coast. The huts could be hired for fifteen pounds a day, they have a tiny fenced in garden to the rear and the front faces the beach. The roof is planted with sempirvirens which will look lovely in bloom. I would want the interior to have nautical stencils and brass lamps similar to this hotel that I decorated further along the coast. Breakwaters stretch into the sea. They were broken, with handy holes to make arty shots through. We walked along the sands, sat amongst the dunes and watched dogs chase things. Then it was time for fish and chips and ice cream. Blyth is a few miles along the coast from the much busier resort of Tynemouth. Tynemouth has a weekend flea market and some very good shops and cafes. It has a beautiful ruin of a priory and it also has a thriving surfing scene. My mum told me she remembers swimming in this pool on her holidays to the north east. Back then Tynemouth was glamorous. It's not bad now but I would love to see the pool and the beach hotels restored in to their Art Deco splendour. They could be decorated with art deco stencils from us! Tyneside folk are known for their ruggedness. I watched the surfers and marvelled at the hardiness of bare legged famillies building sand castles....it's early winter.